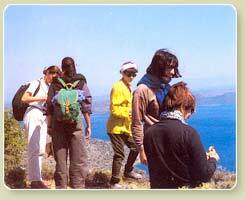 We trek in the most beautiful coastal area of the Turkish Mediterranean laying between Marmaris and Antalya. Known to the ancients as Lycia this fabled coast of clear turquoise blue water is rich with archaeological sites. Fragrant pine forests tumble down a back cloth of mountain slopes to end abruptly in red cliffs, secret coves and sandy beaches. We visit splendid Greco-Roman ruins of the lycian period: Caunos, Letoon, Pinara, Xanthos... With its excellent climate, guaranteed sunshine, this delightful coastal offers to spend holidays trekking in a culture, history and nature combining area. In the morning drive to Ekincik village, winding through the mountainous backcountry. We begin our walk passing through the forest and arrive to the old Lycian city of Caunos (400 BC) with magnificent rock tombs carved into the rock, The extensive ruins include a huge Roman Bath, Persian City walks, a Carian fortress, a Greek theatre and a Byzantine basilica. 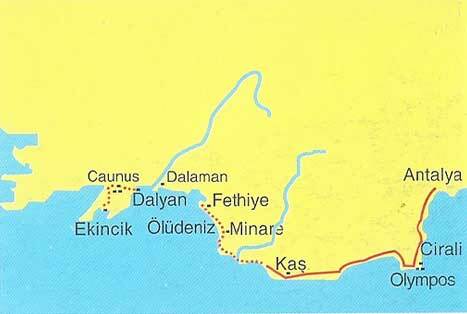 Continue the walking and arrive to Dalyan. We take boat to the hot spring by waterway and opportunity to swim in the natural swimming pools of hot water and mud bath. 5 hours walking. Dinner and Overnight in pension. Drive to Fethiye was the prominent town of Telmessos, but earthquakes have left only a few Lycian stone sarcophagi from the old town, along with the dramatic Tomb of Amyntas carved into the sheer rock cliff high above the town. Walk up to Kayakoy, the largest Greek ghost town in Asia Minor. 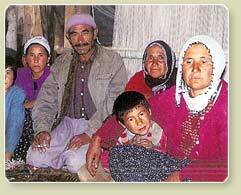 After the foundation of Turkish republic, the governments of Turkey and Greece changed the population. 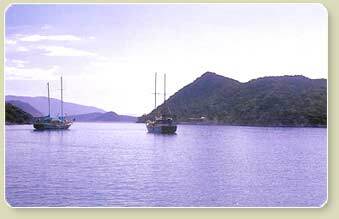 Then walk down to oludeniz, an idyllic sea bay and a quiet lagoon set against a wild mountain backdrop of dense forest. Its beach takes its eerie name from the secluded lagoon at the beach's western end. Protected by hills and entered by a narrow channel, the lagoon is calm during even the worst storms. Chance to swim. 5 hours walk. Overnight in pension. We hike a footpath, through a fragrant pine forest of Mediterranean coast up to Dokuz Gol plateau (1200 m). We stop en route to enjoy spectacular views of the snow-covered top of Babadaglari (1976 m). Descent to Dip village through a low marquis. Arrive in guesthouse but first a coffee at the little teahouse just beyond in Minare village. 6 hours walking. Dinner and overnight in guesthouse discovering a local way of life. Sometimes our walks are combined with sightseeing as when we explore the old ruined city of Pinara - reputedly 1200 rock tombs in various shapes and sizes. On the eastern slope of the lower acropolis, beyond the city walls, there are remains of a Roman bath which was quite popular throughout the Lycian area. and the theatre, leaning against a natural slope, opposite the acropolis and the bath. Afternoon trek on a foothill to Izzettin village, crossing isolated villages in the forested hills and olive groves. A great sight-seeing on the summit of Akdag ridge (3016 m). 5/6 hours walking. Dinner and overnight guesthouse. Today we begin our excursion from Bel village. We mostly follow mule tracks and spend time to isolated houses. We can expect to be invited in their primitive house and be offered some traditional tea as welcome sign. Arriving to Gavuragili beach has 17 km long beach. Depending of the season, we may swim in the clear Mediterranean sea Then we drive to visit old Lyxien city Xanthos that has reputation of committed mass suicide by throwing themselves into the flames. 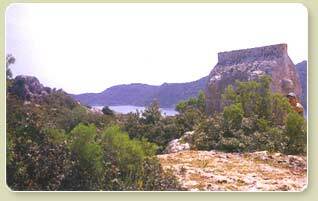 The city itself consists of the Lycian acropolis, Roman theatre and the Harpy Monument .. Then drive to Kas. The ruins of Antiphellos are spread around the town of Kas, which lies at the neck of a small peninsula in the Mediterranean.. 5 hours walk. Overnight hotel. In the morning driving to Olympos which was a port city established in the 2nd century. here we visit Chimera, known as the " burning mountain " (Yanartas), it is a result of escaping natural gas, whose flames have been shooting heavenwards for centuries. Afternoon we have opportunity to swim on the Cirali beach. Then drive to Antalya, Turkey’s principal holiday resort. On the picturesque old quarter, Kaleici, has narrow windings streets and old wooden houses abut the ancient city walls. Overnight in pension in old part. Drive to airport and fly home.